Desperate and on the run, a young man doesn't know what to do. Then he gets some unexpected advice from an unlikely source: himself. But he's not quite "himself." "A low-level criminal steals an ancient Chinese time-travel device, but he may not survive the demonic consequences of tampering with time. 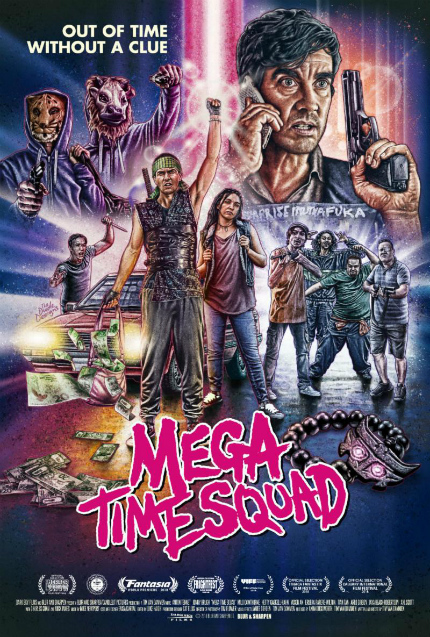 Mega Time Squad is a wildly entertaining time travel/sci-fi comedy out of New Zealand." Our own Kurt Halfyard saw the film at Fantasia last summer and noted: "This is the type of 'Swiss-Watch crafted silliness' (patent pending) that one thinks of with Joe Dante, or Edgar Wright -- and yes, Mr. Waititi. Welcome to the party, Tim van Dammen, there aren't many people making comedies with this kind of razor-sharp filmmaking craft and built in repeat watchability!" Anton Tennet, Jonny Brugh, Hetty Gaskell-Hahn, Arlo Gibson, Milo Cawthorne, Eru Wilton, and Simon Ward star; the aforementioned Tim van Dammen wrote and directed Mega Time Squad, which will open in theaters and on Video On Demand platforms on Friday, February 15, 2019. Watch the clip below, then make your weekend plans accordingly.